Chitwan national park was established in 1973 and became World Heritage Site in 1984. Since then it became a tourist attraction for Elephant safari. Chitwan National Park is ranked as third biggest attraction after trekking and the Kathmandu Valley. This nature reserve protects 932 sq km of sal forest, water marshes and rippling grassland. The park is one of the last refuges of the endangered one-horned Indian rhino and there are sizeable populations of tigers, leopards and rare Gangetic dolphins. It is estimated that 200,000 tourists visit National Park every year. Nepal is home to some 150 wild elephants while number of captive elephants is 208. In Chitwan alone there are 155 captive elephants while number of wild elephants is unknown as there wasn’t any comprehensive research done by the government to establish numbers in Chitwan National park. Most of the 155 working elephants are in hands of private owners. Often elephants are smuggled from India and sold to private owners for 60-70,000 Nepali Rupees (equivalent USD 700-800) Elephants are mainly used to cater tourists for an elephant safari through National Park. 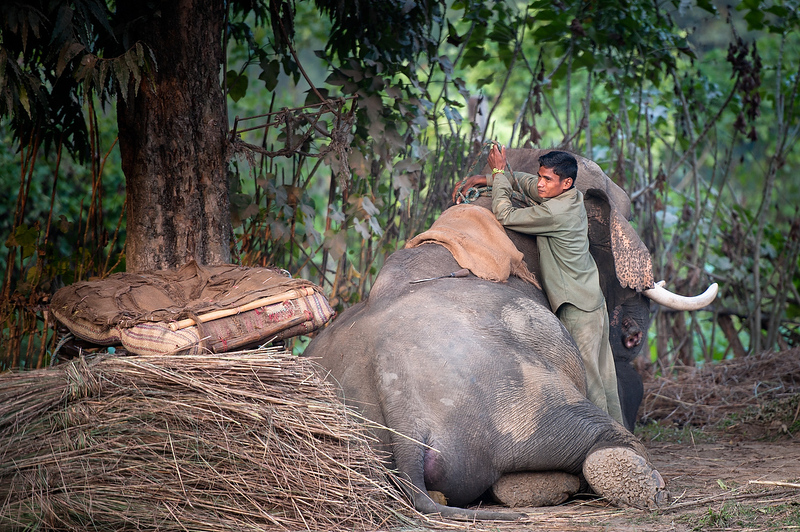 129 private and 90 government elephant mahouts do handling elephants in Chitwan. Mahouts control elephants by three methods; commands given by voice, those given using an elephant prod, a stick ending in a blunt hook, and by applying pressure with the feet and legs. The prod might be to tap parts of the animal\'s body to indicate the angle of work, the desired direction to move indicated with the feet, and the action begun with a voice command.